The biggest building boom in the history of astronomy is upon us. In Chile and Hawaii and in space, astronomers are getting powerful telescopes that dwarf the current state-of-the-art instruments. When the mountain blasting and the mirror polishing are all done, we will have the clearest and most detailed views of outer space ever. This boom has long been in the works for years, as billion-dollar telescopes don't just fund and plan themselves. Now, these telescopes are starting to break ground. "If it all plays out as expected and budgeted," writes Dennis Overbye in the New York Times, "astronomers of the 2020s will be swimming in petabytes of data streaming from space and the ground." Let's take a closer took at what these billion-dollar telescopes can do for astronomy in the decades to come. The most powerful light telescopes today are about 10 meters—or just over 30 feet—in diameter. The Thirty Meter Telescope is, well, exactly what it says. This massive telescope will join 12 others already on the top of Mauna Kea in Hawaii, and a groundbreaking is scheduled for October. The Thirty Meter Telescope's will let in more light than any existing telescope, allowing astronomers look at more distant and fainter objects in the sky. That includes exoplanets and black holes and clues let over from the early universe. The European Extremely Large Telescope (E-ELT) is even bigger than Hawaii's Thirty Meter Telescope. At 39 meters in diameter, it will be the largest light telescope in the world. But there is a part of its name that is less straightforward: E-ELT is not in Europe. The name comes from the consortium that operates it, the European Southern Observatory (ESO) made up of 14 European countries and Brazil. In the Chilean desert, where high and dry conditions are optimal for astronomy, the ESO already operates 8 telescopes including the Very Large Telescope and ALMA, an array of radio telescopes. 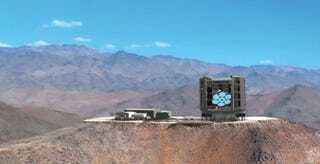 To that, ESO will add the European Extremely Large Telescope. (Where do you go from Very Large, after all?) On June 20 of this year, the official construction of E-ELT began by blasting away the mountaintop where it will stand. E-ELT will be the world's largest light telescope when it is completed a decade from now, and it can gather 13 times more light than today's telescopes. With that power, E-ELT will look for planets of distant stars and signs of dark energy among other things. The long-awaited—and long-delayed—James Webb Space Telescope (JWST) was supposed to launch this year. Since blowing past its initial budget and launch data, NASA promises the ambitious project is on-track for 2018. And it better, because astronomers are eagerly awaiting its data. Like its predecessor the Hubble Space Telescope, JWST will travel through space, where it won't have to deal with the distortion effects of Earth's atmosphere. Unlike the Hubble, its primary mirror is three times as big. And instead of detecting visible light, JWST is specialized to detect the infrared spectrum. That's because JWST is designed to probe the origins of the early universe. As objects in an expanding universe move away from us, the light that comes from them is redshifted due to the Doppler effect. Incidentally, an infrared camera is also great for detecting heat coming from possible exoplanets. Image credit for this and the top image: Giant Magellan Telescope. The Giant Magellan Telescope is made of seven round mirrors, which combined are equivalent to a telescope of 25 meters or 80 feet in diameter. The mountaintop blasting at Las Campanas in Chile happened two years ago, and astronomers are now awaiting the casting and polishing of the 7 mirrors. Because of their size, each mirror can take up to four years to be cooled and polished. Like the Thirty Meter Telescope and E-ELT, the Giant Magellan Telescope's main asset in its size. It'll also explore topics from all over physics, including exoplanets and the evolution of stars and galaxies. At just 8.4 meters in diameter, the LSST might seem puny compared to other new telescopes in development. Its primary advantage is not size but speed. From the Pachón Mountain in Chile, the LSST will scan the entire sky every few days. Over years, astronomers will have a movie of objects in the sky evolving and changing. Object of especial interest include asteroids, supernovae, and icy objects past Neptune.